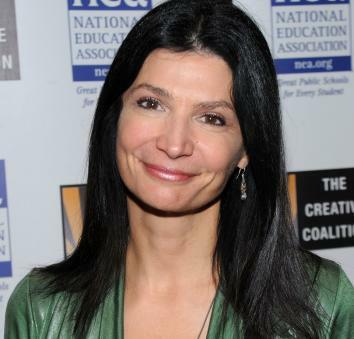 NEA's Lily Eskelsen Garcia apologizes for calling kids "chronically traded" and "medically annoying"
President of the National Education Association Lily Eskelsen García has apologized for remarks she made in October. We serve kids a hot meal. We put Band-Aids on boo-boos. We diversify our curriculum instruction to meet the personal individual needs of all of our students—the blind, the hearing-impaired, the physically challenged, the gifted and talented, the chronically tarded and the medically annoying. Oops. It was, as you can imagine, the “chronically tarded and the medically annoying” bit that caught the Internet’s attention. The video of her speech, which is chock-full of inspirational respect for teachers, has been viewed 1.2 million times since it was posted in early November, but it only recently attracted the attention of advocacy groups. Late Monday night, after the expected social-media firestorm that followed, Eskelsen García posted a (rather excessively jaunty, to this viewer) video and written statement on her website apologizing for her statement. I was not referring to students who are ill or medically fragile. I was referring to the student who, for example, has an argument with his girlfriend and now is having a very bad day, and doing everything humanly possible to annoy the teacher. So where does the “medically” come in here? Because an exceptionally annoying student can harass his beleaguered teacher straight into the sanitarium? Or was it more what it sounded like, a dig at the ubiquity of EpiPens and other serious medical issues pervading today’s schools?